I wanted it for one picture, specifically. The picture I wanted was Kent Twitchell’s “Freeway Lady,” a destroyed artwork that was one of my favorites. Unfortunately, the book is a catalogue of murals that have either been blotted out or badly damaged by vandals and the elements. More important, as we are debating super-graphics on large buildings, the book serves as a reminder of the enormous murals that were painted in downtown Los Angeles and in Hollywood as ads for Nike in a campaign by the Chiat-Day agency. A gigantic mural titled “Baseball” by David Larks covers what was then the Bekins Building. The building is, of course, blank today. 3614 S. Grand Ave., via Google maps’ street view. And here’s John McEnroe by David Larks and Adam Lustig, looming over the Pantages Theatre. 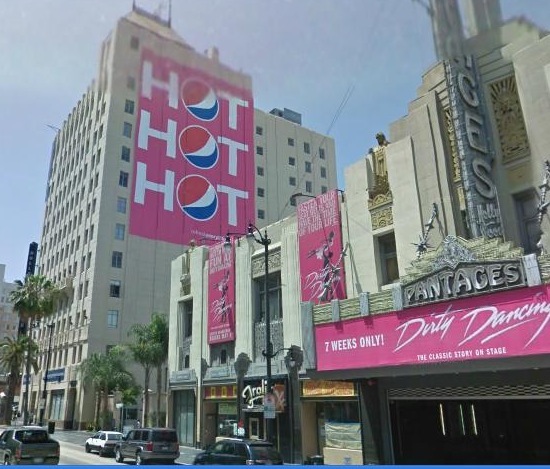 6246 Hollywood Blvd., via Google maps’ street view. Here’s how Ruben Brucelyn’s “Sports” looked in 1988. 604 Glendale Blvd. via Google maps’ street view. It’s important to note that “The Big Picture” also documents vernacular artwork found on the Eastside and Judy Baca’s famous “Great Wall,” in the San Fernando Valley, which has suffered its own type of destruction. Is there any hope in all the gloom and doom? “Nino y Caballo” by Frank Romero is peeling and has been vandalized. Well, I bought “The Big Picture” at the Last Bookstore, which just opened at Spring and 5th streets. So far, the shop seems to be popular. Is it too great a leap to see a connection between downtown’s rebirth and a renaissance in murals? I suppose so. Then again, I wonder what “Freeway Lady” would look like printed as a super-graphic and hung on the Hotel Figueroa. Note: At last report, “Freeway Lady” is to be repainted on a section of the Student Services Building at Los Angeles Valley College. “The Big Picture” is listed on Amazon and Bookfinder. 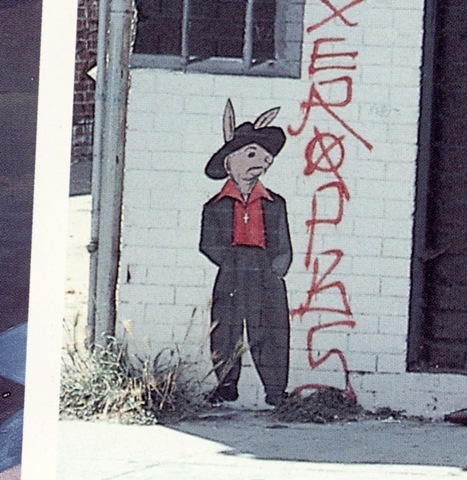 This entry was posted in 1988, Architecture, Art & Artists, Books and Authors, Crime and Courts, Downtown, From the Stacks, Hollywood, Latinos, Photography, Preservation, San Fernando Valley, Sports, Zoot Suit and tagged #hollywood, #la, #photography, Architecture. Bookmark the permalink. At the Santa Monica Hostel on 2nd St. betn Broadway and SM Blvd, the entrance sits back from the street and on the left wall of that open area there are the remnants of signs dating back to the early 1900’s. Not only is it the best mural in LA, it is the best example 0f modern art in LA. I hope it’s still there. The Freeway Lady had a glint of mad knowledge in her eyes. She always caught mine. There is something zen in the impermanence of it all. Perhaps that is what she was showing us. The City of Lompoc has murals galore, and as far as I know, none has been touched by vandalism. We could move the Freeway Lady there, but of course, as there are no freeways through Lompoc, we’d have to change her name. LA was so beautiful just before the Olympics arrived in 1984; if I remember correctly, that’s when many of the sports-oriented murals were first painted. I wish we could give back to the city the sparkle it had 27 years ago.